They may not have photo-realistic graphics or huge, persistent worlds to explore, but simple, high-energy browser games made with Flash or Java have nonetheless been hooking the world for over a decade now. A five-minute coffee break can quickly become a wasted half hour or even a wasted afternoon. Platform-independent, free and quirky, such games are developed by the thousand every year. Like kids in a sweet shop, users looking to fill a few minutes soon get lost in a frenzy of innocent fun. But why do such simple games wield such power? 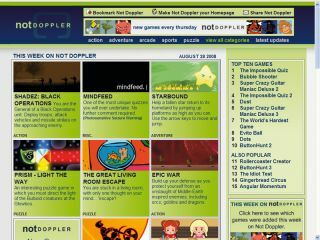 We spoke to the man behind games site Not Doppler to find out. Browser games can and do bring entire offices to a standstill as they slowly addict the unwary with intuitive gameplay. Links sent in emails by impressed friends can result in lost hours and missed deadlines. The reason they're so addictive is that they're such good fun – and there's a seemingly never-ending supply of new games to try. in our office, a mere mention of the words 'Text Twirl' will start fingers twitching. Some companies block the sites that host browser games, fearing a performance meltdown. We loathe to admit it, but they may have a point. Sometimes zany and often ingenious, browser games range from fiendishly difficult puzzles to arcade classics – and they're all available, free, at the click of a mouse. Some are highly abstract, and original enough to defy classification. Others are puzzles, requiring the player to figure out the underlying 'vibe'. Some even represent a free and effective alternative to the current craze for software that 'trains' our brains. But even when such games are helping us to think faster, it's difficult to deny that the reason we keep going back to them is more to do with their addictive qualities. Take Milpa by Interactive Pulp as an example. All you have to do is swap the order of a line of different vegetables to match up three or more before an animated skull chomps them all up. Each level brings additional fruits to swap around. You must quickly improve or it's game over. It's a simple game, but for some reason it's one that people can't help repeatedly returning to. So what makes it so good? "In my opinion, a game that strikes me as good is one that has high replay value," says John 'Dask' Daskalopoulos. He should know. He runs the popular browser game community site Not Doppler. "For me," he tells PC Plus, "games which pose a tough but not unrealistic challenge and also provide a fair amount of replay value are what I would classify as 'addictive'." The languages behind these games were originally designed to make the World Wide Web more functional and interactive, and the two primary languages used to create browser games are Flash and Java. Released in 1996 and originally called Macromedia Flash, today Flash is a de facto standard for adding interactivity, animation and even video to websites. It contains a scripting language called ActionScript, which is excellent for writing browser-based games. Originally created by Sun Microsystems, one of its design goals was that developers should be able to write a program once, compile it and run it anywhere without modification, regardless of the hardware platform. Originally slated for its poor speed, modern Java has come a long way both in terms of speed and the libraries available. So who is developing good games with these languages?